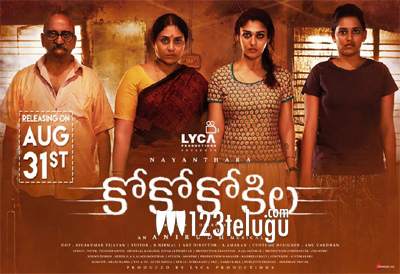 After winning accolades and ending up as a box-office hit, star heroine Nayanthara’s latest crime thriller, Kolamaavu Kokila (CoCo), is all set for its Telugu release on August 31. CoCo is releasing in Telugu as CoCo Kokila. In the movie, Nayan plays the role of a drug peddler. Kolamaavu Kokila released on August 17 and went on to collect over 15 crores worldwide. The Telugu version’s ‘Guns in Love’ video song will be released tomorrow. Nelson Dileep Kumar has directed CoCo Kokila and leading Tamil production house Lyca Productions has bankrolled it. Anirudh Ravichander has scored the film’s music.